Concerts explore the history of jazz in America. 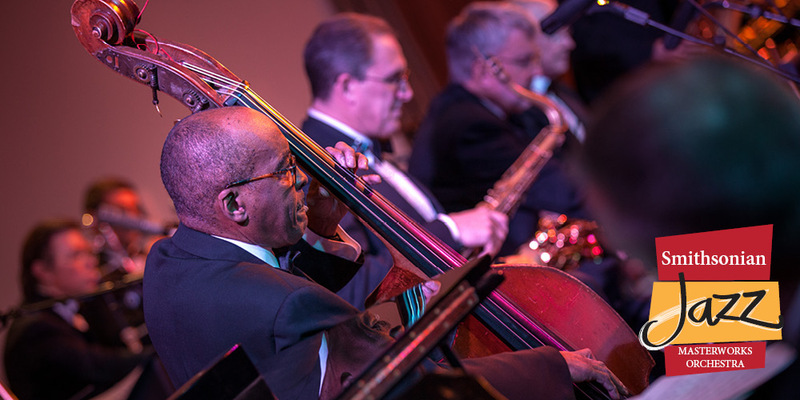 The 2019-2020 Smithsonian Jazz Masterworks Orchestra season offers an incomparable experience for jazz lovers, music enthusiasts, and fans of the orchestra. Building upon the 2017–2018 Jazz and Democracy season, the orchestra is embarking on a global tour that will take the orchestra across the world to share a diverse program of American and international jazz. See the tour schedule for news and information on each bespoke concert and guest musician. Be the first to know about additional concerts during the 2019-20 season! Join the jazz e-newsletter. The museum’s Constitution Avenue doors will open at 6:30 p.m. and the LeRoy Neiman Jazz Café will be open and serving light fare and drink options for purchase from 6:45 p.m. to 9 p.m. Food and drink are welcome at seats in the Performance Plaza. Tickets range from $25-$40 depending on the venue and seating options available. Where/How do I get my tickets? All tickets will be held at the Check-In table for pick up on the night of the concert. What is the difference between Standard and Table seats? For all concerts in the Wallace H. Coulter Performance Plaza, there are two seating options available for purchase. Table seats are at 4-top tables in front of the stage. Standard seats are single chairs in raised rows wrapping around the tables. Food and drink are available to be purchased and carried to both seat types in the Performance Plaza. For all concerts in the Hall of Music, there is only one type of seating option in a standard concert hall layout. For concerts in the Wallace H. Coulter Performance Plaza, table seats are assigned to Season Pass holders and individual ticket buyers based on time of purchase. Standard seats in the Performance Plaza and the Hall of Music are first come, first seated. Can I sit with my friends/family who also bought table seats? If you and your friends/family bought table seats separately and would like to be seated together, please contact us at jazz@si.edu at least three (3) days before the concert with the names on each purchase. We will do our best to seat you all together. The sooner you notify us, the better. Street parking is available on Constitution Avenue after 6:30 p.m. Doors open at 6:45 p.m., music kicks off at 7:30 p.m.
Light fare (sandwiches and snacks), beer, wine, and non-alcoholic drinks will be available for purchase from 6:45 p.m. and on. For all concerts in the Performance Plaza, food and drink are welcome at the seats, during the concert. For all concerts in the Hall of Music, food and drink must be consumed before entering the Hall. Do you have accessibility services? The National Museum of American History welcomes visitors of abilities. Requests for accessibility services at our concerts can be made by voicemail at 202-633-3150 or by email at jazz@si.edu. Two-week’s prior notice is preferred. Have more questions? Contact us at jazz@si.edu or 202-633-3150.